Very cool cardie Harija! Love the print! This set is wonderful! I like the jacket! Amazing look, love your cardi!!!! I really love your cardigan ! I'm liking the sweater. It looks great on you! Hey here! Thanks for stopping by my blog! Loving this black and white look. The sweater is stunning! 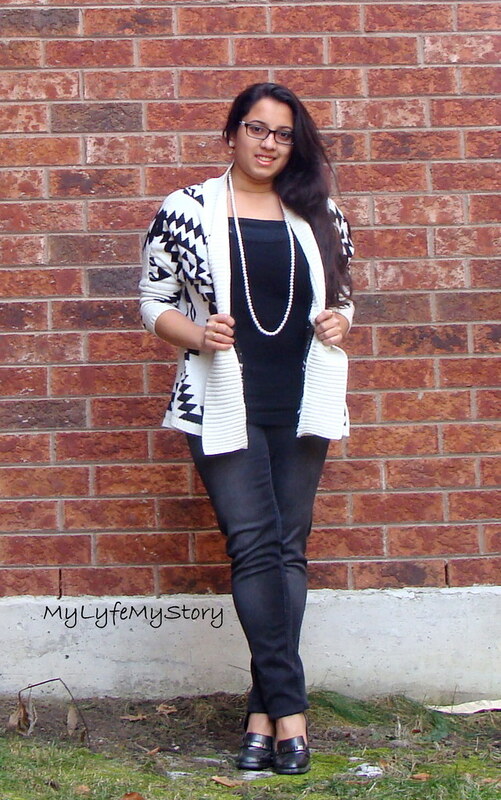 Great cardigan and I love your shoes ♥ You look amazing Harija! That's a great cardigan - stylish and cosy! Nice cardigan , perfect in black and white. Well, hello there from a fellow Canadian blogger! LOL! I didn't know you're located in Toronto, how's the winter there? I'm in BC and it's been endless pouring rain, terrible. The cardigan is gorgeous! I love the Aztec print on it, really lovely and I can see it paired with many outfit. Beautiful sweater and your blog is amazing. I'm your new fan in GFC you welcome to check out my blog.Hugs. i'm a huge fan of aztec prints. love the look you put together here! Really chic cardigan, love the striking aztec prints! Loving the effortless chic look here. It's perfect, girl. I love this print, looks so cheerful ! What a nice cardigan! Love the Aztec print! WoW! Stunning look! That cardigan is fantastic! Awww...you look lovely. I really do like the Aztec design of that cardigan. Welcome back... the queen of modesty!! Amazing black and white look. I looove your cute cardigan! Nice cardigan, love the print! Have a lovely day Harija! Loving your cardigan way too much, we bet it goes with everything!! Love your pictures. Your cardigan is beautiful. Love that aztec cardigan! I'm still looking for the perfect one to add to my closet! Cute outfit - loving the whole look! you look great!! love your sweater!! Perfect cardigan ! Aztec print is one of my fav ! I love your shoes too. You are very pretty. I'll post my outfit with this cardigan soon! your hair looks so good in all of your photos! what hair care products do you use?